How long does it take musicians who haven't played together for 20 years to reconstruct the profound musical understanding they shared in the past? Not more than a quarter of an hour, if we take the Zaviot ("Angles") band as our example, one of the innovative jazz combos active in Israel in the 1980s, which held a reunion performance yesterday at the Levontin 7 club in Tel Aviv. 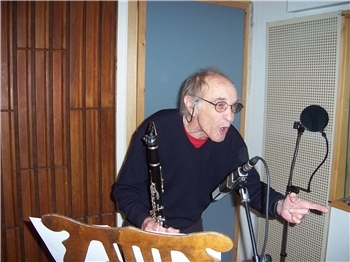 Three days before the performance they met for their first rehearsal at a small studio in Hod Hasharon - three of the original members of the ensemble (clarinetist Harold Rubin, bassist Mark Smulian and percussionist Reuben Hoch) and young guitarist Arli Lieberman, who was born when the combo was in its heyday. Hoch, who initiated the idea of the reunion and came especially from Florida for it, had landed a few hours earlier, but seemed fresh and enthusiastic, ready to attack the drums. "Oy, Reuben, are you still involved with God?" asked Rubin, a sworn atheist, when he noticed the skullcap on his friend's head. When the four started playing, they made mostly noise ("masturbation," Smulian defined it later), but within a very short time it was possible to discern a slender thread of logic in the music. Smulian played a round, beautiful bass riff, Rubin played a parallel melodic line on the clarinet and Hoch provided a steady beat, but not too steady. It was clear they were going to need much more rehearsal time. But when Rubin began playing a frenetic solo - and Smulian shouted at him, "Play your horn, little white man!" - there was no doubt that the spirit of inquiry, the humor, the energy and the adventurousness that once characterized Zaviot had not been lost. Before one number, Rubin told the others he wanted the feeling of a tap dance. When Lieberman the young guitarist did not express this, the clarinetist, more than 50 years his senior, stopped him and said, in a mixture of Hebrew and English: "Be like a retard, play whatever comes, without thinking." "When you're playing free music, it's very important to be a Neanderthal sometimes," Rubin had said the previous day, at his home in Tel Aviv. "You're building a language, but you have to be careful that the language doesn't take you over and cause you to stop searching. The trick is to play without knowing exactly what you are doing. To come as empty as possible, to start with some note that turns you on and build something from it." Rubin's long-standing commitment to this kind of thinking, and the fact that he instilled it in a generation of free-jazz musicians in Israel, most of whom could be his grandchildren, are the reasons he has won this year's NIS 50,000 Mifal Hapayis Landau Award. "Even though this genre [free jazz] isn't among the most popular, Rubin has insisted upon not making compromises, sticking to his principles and confronting the Israeli audience with a different kind of thinking," the prize jury wrote in a statement about two weeks ago. Born in South Africa in 1932, Rubin was attracted to jazz in his youth because of two things: Benny Goodman's playing, which led him to choose the clarinet; and the wild dancing that was an inalienable part of swing. Anyone who has seen him perform knows that at Rubin's advanced age, he is still a very physical musician. His movement on stage is almost a dance. "It's only through the physical energy that I can reach the inner energy," he explains. "This is the only way I can use every millimeter of myself." In the 1950s, he demonstrated against the apartheid regime and played with black jazz musicians, but what got him into trouble with the authorities was his drawing of Jesus on the cross and the accompanying line, "Forgive him for he knew not what he is doing." "They also said that in my drawing I had given Jesus an erection, which wasn't true," adds Rubin. After his trial, which lasted five weeks, he was acquitted of blasphemy, but decided to leave South Africa. Rubin arrived in Israel in 1963 on an extremely hot, dry day with desert winds blowing, and fell in love "with the yellow sky," he recalls. "But I've always felt like a stranger, everywhere, and here too I feel like a stranger. That isn't bad because there isn't any one place that is my home - everywhere I am is my home." He also felt like a stranger when he tried to integrate into the young jazz scene here: "There were excellent musicians here - Danny Gottfried, Albert Piamenta, Areleh Kaminsky - but I was looking for something different. I didn't want to play standards, and to my regret I didn't find people who wanted to experiment with me." Rubin stopped playing, began working as an architect, taught drawing at the Bezalel - Academy of Arts and Design in Jerusalem, and only in the early 1980s went back to playing seriously. When he was looking for a bass player, someone recommended Smulian and that's how Zaviot was born. Rubin came from South Africa, Smulian from England, Hoch from the United States and guitarist Tony Berman was from Canada. They performed at a small club in Tel Aviv - at first blues and standards, in fact, but gradually they developed an independent sound characterized by elements of jazz, groove and rock. "We weren't from here, we didn't know any of the cliques, so we simply did what we wanted," Smulian explains. "I'm not sure we were all that good, but in Israel it was something new. No one here had done anything similar." Considering they were an unconventional jazz ensemble, Zaviot won surprising success: They performed regularly, recorded and went on long tours in Germany. "Zaviot's music was a lot more communicative than what I'm doing today, with a very strong beat," says Rubin. Smulian's explanation for the success in Germany: "We didn't think of this at the time, but to the German ear we sounded like an 'Israeli Jewish jazz band,' and that did the trick." In 1989, Tony Berman returned to Canada due to family pressure. "I remember he came to my house with his father, and his father said: "Is this how you want to live, like alte zachen [old rubbish, in Yiddish]? Like this man?" laughs Rubin. Without the guitarist it was still possible to manage, but when Hoch decided to return to the United States, Zaviot broke up. Rubin was almost 60 at the time, but during the subsequent 20 years he never stopped creating and renewing himself. Since the 1990s, young musicians who play unconventional jazz have been seeking him out: saxophonists Ariel Shibolet and Assif Tsahar, pianist Daniel Sarid, and in recent years pianist Maya Dunitz and clarinetist Yoni Silver, with whom he issued a disc about a month ago entitled "A Mono Musical Suite for 3 Manic Musicians." Rubin has become a kind of father figure for these musicians but, he says, "I learn a lot from them, and I am not saying this because I am modest. When I play music with them, I understand things about rhythm, about keeping up momentum in playing and most important: I get stimulation from them. "When I wake up in the morning I feel alive," Rubin continues. "It is like a big miracle. It's very important to me not to waste my life. So I do things, mainly for myself. Very egotistical, in some way. It's not that I'm serious; I don't take myself seriously. But in fact I am very serious. Music, and also painting - this is my life. Without it I would not be sane at all." Zaviot was created in 1986 in Tel Aviv by Harold Rubin, Mark Smulian, Tommy Bellman and Reuben Hoch. The group performed throughout Israel and represented jazz from Israel throughout Europe. Zaviot recorded 3 albums on Jazzis Records which featured guest artists Christoph Spendel and Dave Liebman. The group toured Germany in 1989 with the late saxophone great, Jim Pepper. Zaviot appeared at Jazz Ost West, Leverkussen Jazz Fest to name a few. Zaviot was widely appreciated in Europe as one of the jazz scenes most original groups. Zaviot's influences are ecclectic and include Miles Davis, Weather Report, Charles Mingus and Ornette Coleman. Zaviot has composed all original material throughout the years. The group features Harold Rubin on clarinet , a versatile artist who is recognized for his paintings and architectural design. Harold is a recent recipient of Israerl's respected Landau Award for musical excellence. At age 75, he continues to charter new artistic territory in both music and art. Bassist, Mark Smulian received his education at the Mannes College of Music in New York. He has developed a reputation as one of Israel's great musicians and composers. He is very active at his Kfar Saba recording studio. Guitarist, Arli Lieberman at age 21 is the newest member of the group. He fashions himself after guitarists the likes of John Scoffield, Jimmy Paige and Jimi Hendrix. This young player is well above his years and shows great promise. He has contributed greatly to Zaviot's unique improvisational approach. Drummer, Reuben Hoch returned to the US in 1988 to pursue his musical career. His credits include; The Chassidic Jazz Project, Reuben Hoch and Time, West End Avenue, Dave Liebman, Jim Pepper, Jeff Andrews, Greg Osby, Ron McClure, Don Friedman, Ed Schuller, Lonnie Plaxico, Christoph Spendel, Leni Stern amongst others. He currently resides in South Florida and is highly respected on the jazz scene. In February 2008, Zaviot reunited for a 20 year reunion album. The group also performed in Tel Aviv at Levontin 7. Zaviot now presents itself as a very strong musical force that looks forward to the release of a new CD and touring. As the group has a very strong connection to The Red Sea Jazz Festival dating back to 1987 and 1988, performance in 2008 can be very exciting to the audience and festival alike. Check out a segment of Zaviot's recent performance at Levontin 7 in Tel Aviv; www.youtube.com/rhochjazz. 8 tunes per set ranging 60 minutes perset.